So, the little one is turning three this year and likewise for the elder sister previously, I've been holding back on letting her attend any formal classes. That is not because I am homeschooling her but because I think at such a young age, it's more important for us to spend one-on-one time together, bond as mother and child, and learn through play. The thing is, as an inquisitive toddler, she has been showing signs that she has a capacity to absorb more knowledge and understand more concepts as time passes. Thus, there are days when I wonder how else I can stimulate her and help cultivate a love for learning, which I believe is crucial to start instilling from young. Moreover, the location was accessible for us as Ariel and I would be able to take a direct bus to the Hougang branch while the big girl is in school. Thus, I found the motivation to let her attend her first formal class and I have to say on hindsight, it was definitely a great decision. Classes are available from Thursdays to Sundays from 9:00am to 6:30pm. Each lesson is 70 minutes long, takes place weekly and each term consists of 12 lessons. The lessons are conducted in English and Chinese, and alternate every week. All children aged 6 months to 5 years old are welcome to join and different programs have been designed to cater to the needs of the diverse age groups. There are currently two My Little Genius branches in Singapore which are located in Jurong East (near Jurong East MRT station) and Hougang (near Kovan MRT station), and the third outlet will be scheduled to open in Tampines in January 2016. For maps and more information, go here. 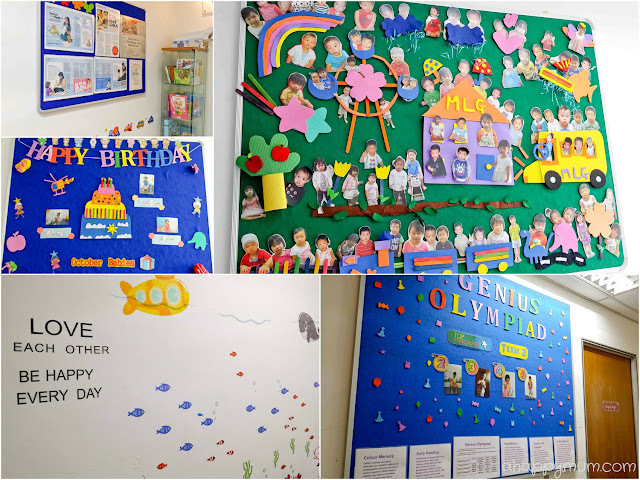 Although the centre might not be huge, it feels welcoming and cosy with its multi-coloured furniture, cute wall decals and lovely collages of the kids on the boards. Right at the entrance, you walk in to see a board that shows the lovely pictures of all the current students. There is also a congratulatory board to wish the little ones whose birthdays fall in that month, how sweet, right? After you enter, you will see a shoe rack which lets the little ones learn to take off and place their own shoes neatly. Colourful chairs and benches are also available for parents and kids who arrive ahead of lesson time. 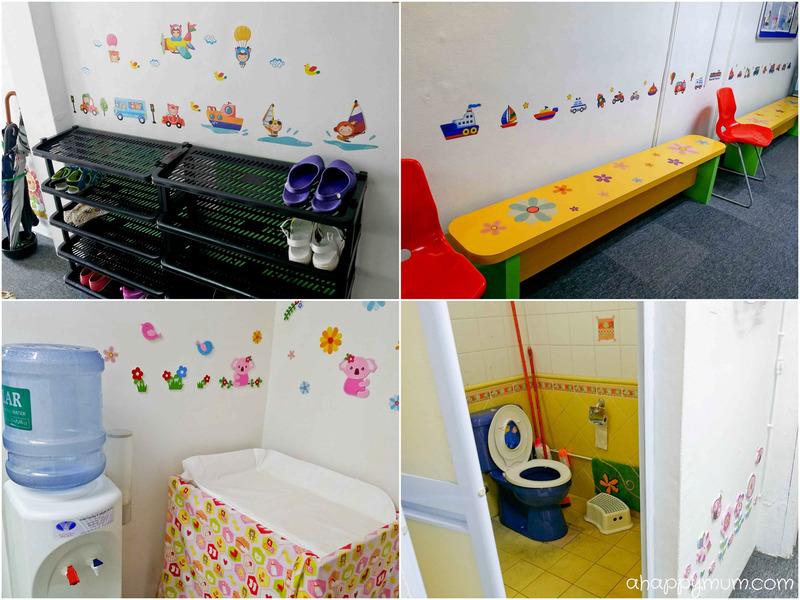 Those with infants and younger kids will be happy to know besides a washroom, there is also a diaper changing table and water dispenser for parents to make use of. This is probably one of the kids' favourite areas - the play corner. Kids who arrive early or wish to stay a little longer after class can feel free to make use and play with the toys and books here. I must say this is a pretty good way to keep them happy and make them look forward to visiting the centre every week! For me, I especially appreciate this corner because on days when the big girl accompanies us for make up classes, she can make use of the tables and chairs to do her work or engage in her own free play while the little one and I are in class. Phew. Coming to the classroom, each class can accept a maximum of six parent-child pairs and there will be one teacher to conduct the lesson. Only one parent is allowed to accompany the child for lessons but as the centre encourages both parents to play an active role in the child's education, they can alternate in the language of class they attend in a term. For me, I'm just lucky to be the one to be with Ariel for every class. Instead of sitting beside the child, the parent will sit behind his/her child and since parental guidance and interaction are encouraged for the whole lesson, they are kept pretty involved too. What I like about this setting is that not only does it feel homely; it also helps to build up bonding between parent and child and enables us to spend quality time while learning at the same time. The teacher will at times ask the child to give mummy a hug, high five, ask mummy to read to child, do craft activities or let them sing and dance together, which definitely thrill and delight both Ariel and I. Since Ariel is turning three this year, we attended the Genius Explorer class and will be reviewing what she has learnt in the last term. At the start of every lesson, the teacher will introduce the theme, state the day, date and weather and parents will be able to see a brief outline of the lesson content on the whiteboard. The child will be tasked to carry out memory activities where they need to remember the objects and colours and put them in place. For instance, they might be shown a grid with three or four different objects for a few seconds and then asked to put the objects in place onto an empty grid. In Colour Memory, they will need to remember the sequence of four different colours - red, blue, green, yellow and be asked to colour empty shapes accordingly. Sounds easy? I thought it could be challenging for even some adults! The thing is, every time the teacher will only show you the picture for a brief five seconds (or flash it at 1-second intervals) and the child will be expected to do it on his/her own. What amazed me was that although Ariel does not get it perfect every time, she is getting better at it as time passes and I think she might have a better memory than what I imagined. It really heartens me to see that beam on her face and feel her sense of achievement when she gets everything right! At every lesson, the teacher will also flash several set of flashcards to the students at the speed of light. Well, nearly. The first time I encountered it, I was surprised by how fast the teacher would flash and amazed by how fast she could say the words of every object, country flag, food, verb or adjective. It was then that I was told that research has shown that a child’s processing speed is several times faster than adults and that children process information through images. Flashing the cards quickly while emphasizing on the pronunciation of word on each card will help the child to stay focused and not find it mundane. Tangrams puzzles and building blocks are two of the challenging activities that we look forward to. The child will be given a puzzle or a diagram, in which he/she has to fit in the tangram pieces or assemble the blocks accordingly. I find these tasks a little daunting for a three-year-old so it is good that the teacher always gives a demonstration at the start, including using shapes and alphabets to describe the tangram pieces, and explaining how the 2-dimensional picture transforms to a 3-dimensional building block structure. One of Ariel's favourite activity is the maze - which comes with cute illustrations like animals, fruits or architecture to interest the child. She will use the whiteboard marker and from the starting point, make her way along the path to the finishing point. Then she will erase it and do it backwards. I love how this activity makes her think in order to solve problems and allows her to learn through trial and error. In some lessons, there will also be fun, unique IQ activities, for instance in her first class, she was tasked to find matching fingerprints! I found that quite unbelievable but to my surprise, she actually enjoyed doing it and even managed to match more than half of them correctly. Now, this is of course one of my favourite parts of the class because you know how much I love crafting with the kids. It's pretty impressive how the teachers manage to squeeze so many activities into a 70-minute class and I like the fact that the lesson is fast-paced, activity-packed yet enjoyable. Some of the craft activities might be split over two lessons, for instance Ariel did a paper lantern and made a shooting star by punching circles and colouring, both of which took two classes to complete. There are also activities which help the children to improve their fine motor skills, for instance Ariel used tweezers to put rings onto elephant trunks and also picked up tiny pom poms. Once, she even pretended to be an astronaut and had to put flags made out of toothpicks into small holders on each of the planets. Even though these pretend games might be short and only take place for a few minutes at the start of the class, I can see that she thoroughly enjoys every of them and they definitely help to warm her up and make her feel at ease for the rest of the lesson. Chinese writing is one of the things that I have not done much with Ariel so I was glad to know that in Genius Explorer, she learns about the strokes, practises them in class and also takes back worksheets to further revise at home. Like her sister, bedtime story reading is always a must for this girl and I am relieved to see that she enjoys reading too. I do find that some of the stories told in class are a little too complex for her age, for instance one was on dinosaur fossils and archaeology terms, which is why she might have a tendency to get a little fidgety at the end. Through creative methods, she also learns about number compositions and how to count in 2s, 3s, 5s and so on. Sometimes she has to add marshmallows to coffee cups, sometimes she has to 'eat' pizzas and count the mushrooms on top, sometimes she has to arrange shoes in the shoe cabinet. How fun, right? In Genius Explorer, the child is also introduced to the concept of science. Experiments are performed for the child to understand simple science concepts, for instance we learnt about air pressure, static electricity, sound waves and gravitational force in this term. Now, can you guess what Ariel enjoys most in every class? Every teacher of hers can tell easily. She thoroughly loves the dancing and singing! No matter if it is a nursery rhyme that she already knows or a brand new song, she will start to hum, shake her head and move her body whenever the music turns on. In fact, she will even keep singing the songs and show everyone her new moves at home. The teacher will also carry out some brain gym exercise with the kids, for instance teaching them to stretch. Well, it doesn't matter if this girl is the only one in class or if she has fellow classmates, as long as the teacher says it's time to sing and dance, you can see her happy smile, how she sings her heart out, how she dances with passion and how she truly enjoys doing them. In line with the different themes, the child (and the parent) also get to pick up some general knowledge. For instance when we were learning about the solar system, I was surprised to see that the teacher actually taught the names of the eight planets and the asteriod belt in Chinese! Gosh, even I couldn't name half of these correctly and it was a learning experience for me too. Yes, obviously Ariel can't remember these difficult names but at least she was exposed to some general concepts about outer space and astronomy. So that generally sums up the lesson contents and our experience for the past term. 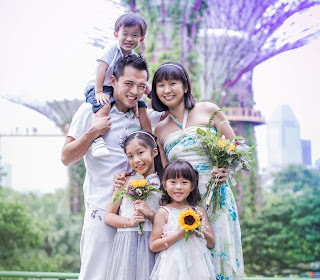 If I have to pick the one thing I love best about My Little Genius, it is the fact that they conduct lessons in both English and Chinese, which helps young children learn to be effectively bilingual. 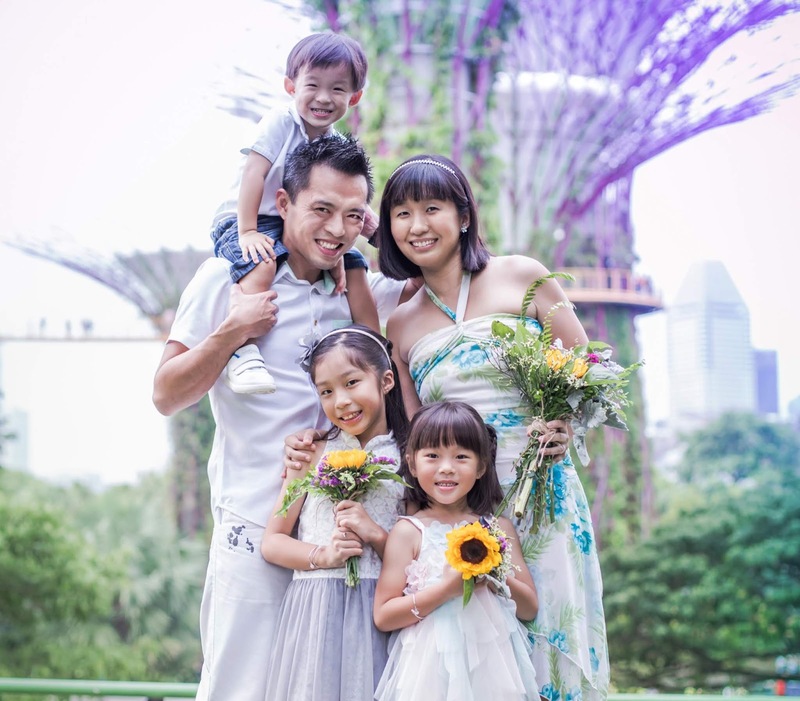 Having taught Chinese to children previously, I cannot overemphasize how important it is to start instilling a love for the mother tongue since young and that is why we communicate with our kids primarily in Mandarin. 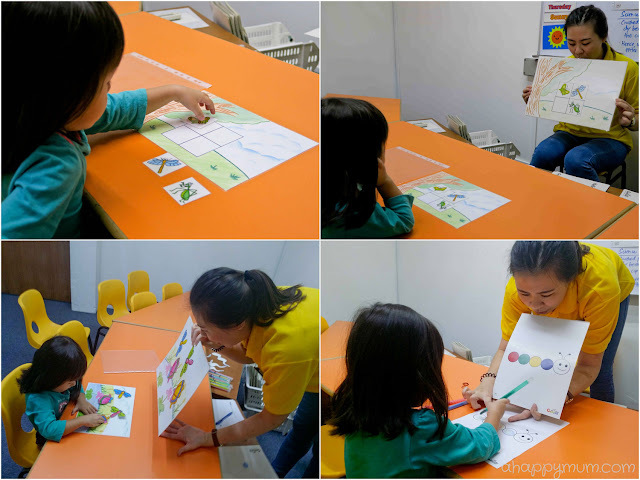 Thus, I am really happy to know that kids who attend classes in My Little Genius are exposed to both English and Chinese languages (one language a week) which are used to conduct brain-stimulation activities that help to unleash their potential. It's never too early to start building a love for learning. Seeing how much she looks forward to her classes every week, I hope this will mark a good start and that my girl will continue to have a positive attitude towards learning! Quote "ahappymumxMLG" to receive a set of A Bit of Intelligence (BIT) card (worth $50) sponsored by My Little Ones in addition to a 10% discount off total course fee when you sign up with My Little Genius for a minimum of 2 terms. BIT card redemption is only valid for the first 30 sign-ups at each outlet. Note that the titles are up to MLG's discretion. More information can be found here. To find out more, visit My Little Genius website, Facebook or subscribe to their newsletter. Disclosure: This is Part I of a sponsored collaboration between My Little Genius and A Happy Mum. We were invited to review Genius Explorer and Ariel attended a term of complimentary lessons in return. All opinions are ours.